Years ago one of my students created a beautiful drawing, which I framed to inspire myself when I teach, also hoping all the students who come by my studio feel the same - especially after days of hard work. I love everything about what music enhances and offers in life, and I share what I enjoy with my students in private lessons and in theory classes for all young musicians. My background with Suzuki Method, and experiences gained from years of study at Juilliard (BM) and Yale (MM, AD) allow me to teach at all levels in my private studio. 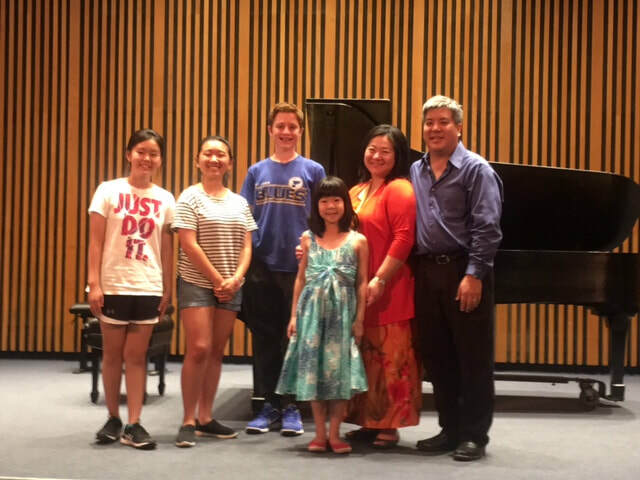 Students choose how much to demand of themselves, but typically they participate in MTNA/ MMTA, NFMC and the Piano Guild (American College of Musicians) events in addition to required semi-annual studio recital. My studio has produced MTNA and MMTA State Winners and winners of MYO/MMAMTA Pre-collegiate Concerto Competitions, and continues to be active in Piano Showcase at the Missouri Theatre, presented by the Missouri Symphony Society's Women's Symphony League. Ideally a student commits to practicing everyday the minimum length of weekly lessons. Please note that sometimes there is a waiting list for my studio, and e-mail is the main source of communication. To request more information and/or a free 30-min. consultation (upon availability*), please fill out the contact form. * I am not accepting any more students until May 2019. 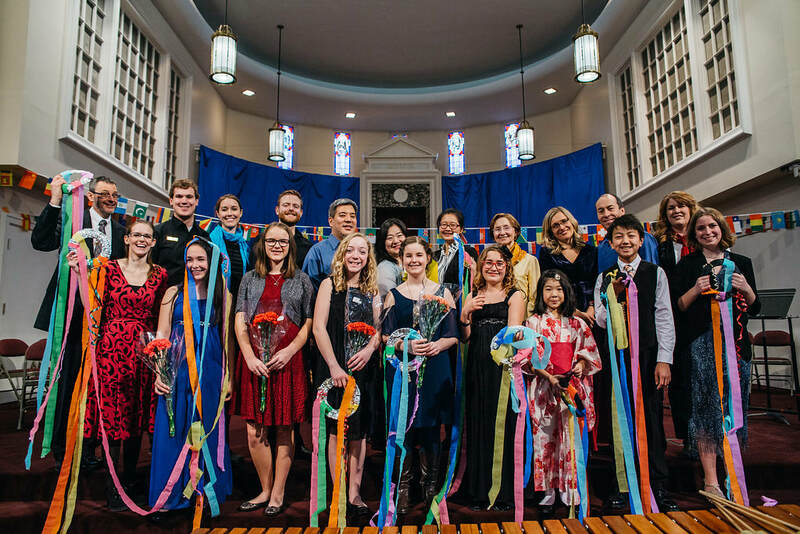 Odyssey Chamber Music Series "Kids@Heart" Tales Around the World, January 13, 2018. We had an array of ensembles which composers matched his/her country's folk tales. Odyssey Chamber Music Series "Kids@Heart" Dance Music, January 17, 2015. We had an array of piano ensembles, a piano trio, and even a ballerina and a hula hoop choreography. 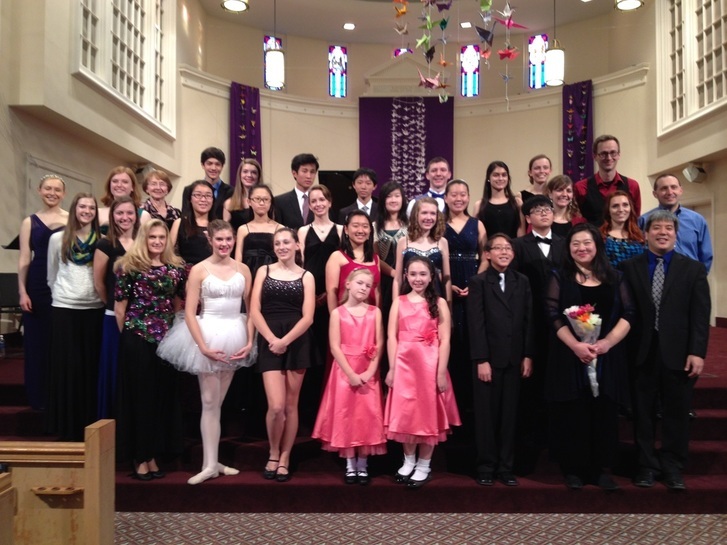 Odyssey Chamber Music Series' "Kids at Heart" Concert, January 18, 2014. 21 pianists took turns playing the piano solo part to Saint-Saen's Carnival of the Animals.